In recent years, extending 3-phase power distribution all the way to server cabinets and racks has become extremely popular in new data center builds—for many good reasons. Principally, for cabinet power capacities above 5kVA, utilizing 3-phase rack power strips can significantly reduce the copper required to supply such dense loads. If I plug in a 250W power supply (about 1.2 amps) on this receptacle right here, how will that affect the current that flows through each of the three phases of this rack power strip? Which one will be closest to tripping a circuit breaker? In North America, where 3-phase, 208V power distribution is wired “line-to-line”, the answer to this question is particularly counter-intuitive. I was astonished to find that the almighty Internet offers virtually no good tools to help answer this question, and so created one together with my colleagues at Raritan (link follows). With single-phase power strips, loading and provisioning is straightforward: if you add a device to the rack that draws 10 amps—in turn, 10 amps of additional load is drawn from the input line of the power strip. But with 3-phase power strips, when you add the same 10 amp device to a server cabinet, it is unclear what results. From which of the three lines will additional current flow? How much of the 10 amps flows from which of the three lines? etc. As we shall see, the answer is not always obvious. In turn, 10A of current flows from L1; and 10A of current flows from L2. This is intuitive, and indeed, it does happen exactly as you would expect. In fact, this does not happen! But on L2, the current becomes 17.3A—NOT 20A (10A + 10A). On the surface, 17.3A on L2 appears to be a completely random number. There are two 10A loads that are wired to L2, but the current is not 10A, not 20A, not 15A, but… 17.3A !?!? Absolutely true story. Obviously, the moral of the story here is: don’t ask an engineer to explain things in laymen’s terms. In all seriousness, the essential truth illustrated by the diagram is that the amount of current on a given line (L1, L2, and L3) depends on the amount of current on the other two lines. Calculating each line value requires vector addition (a.k.a. “complex” arithmetic), which really cannot be done in your head—or even with simple Excel formulae. This 3-phase current and power capacity tool, which you can download by clicking on the button above, is completely vendor agnostic. Regardless of the manufacturer of your rack power strip, this tool will be applicable. 50A (35A derated) : Hubbell CS8365C “California-style” input plug, but with only three branch circuit breakers [or, less desirably, fuses] on the unit. 50A (40A derated) : Hubbell CS8365C “California-style” input plug, but with six branch circuit breakers [or, less desirably, fuses] on the unit. 60A (45A derated) : IEC 60309 60A, 3-pole / 4-wire, “pin-and-sleeve” input plug, but with smaller, 6# AWG gauge input conductors. Check your manufacturer’s spec sheet closely. If it states that: (a) the rated current is 45A; or (b) the rated power capacity is 16.2kVA [not 17.3kVA], then you have this type of power strip. 60A (48A derated) : IEC 60309 60A, 3-pole / 4-wire, “pin-and-sleeve” input plug, but with larger, 4# AWG gauge input conductors. Check your manufacturer’s spec sheet closely. If you have this type of power strip, the spec sheet will explicitly state either: (a) the rated current is 48A; or (b) the rated power capacity is 17.3kVA [not 16.2kVA]. Simply download the 3-phase Capacity Planning Tool, and select the correct worksheet among the five tabs along the bottom. Enter in the expected amperages per outlet, being careful to enter loads underneath the correct corresponding circuit breaker heading. 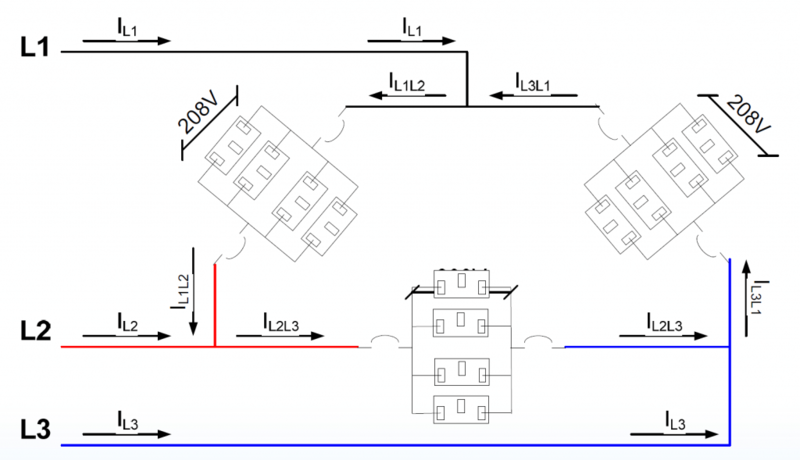 (That is, look at your power strip physically [or on engineering submittal drawings], to determine whether a given outlet is on the L1/L2, L2/L3, or L3/L1 branches—also known as XY, YZ, and XZ). The tool will automatically calculate the resulting current (in amps) on each of the three lines, and highlight any possible error. If you do not see any red warnings (“OVERLOAD” or “ERROR”) on your spreadsheet, then you are good to go! Note that, if you have a fully-redundant environment (Tier IV), wherein each server cabinet uses two rack power strips originating from two redundant UPS feeds, you should enter loads into this tool assuming that one of the two rack power strips is offline. This ensures that you have enough power capacity on the rack power strip, in case such a power loss does occur. This tool is provided only for your guidance and convenience. Its calculations are not warranted by me or by Raritan (i.e., check your work with actual measurements). Finally, as it is relevant: allow me to plug the real-time energy metering provided by Raritan’s portfolio of rack power distribution units. Our devices provide billing-grade accurate power information (amps, kWh, voltage, power factor, kVA, kW) for every cabinet—and in many models, for every power supply in every cabinet. Such information perfectly complements the provisioning task which this 3-phase capacity tool enables. Also, your purchase helps fund my children’s future college educations. Hope you find this helpful. Comments welcome, as always. Learn about Raritan Power or request a call from a Data Center Power expert.